Central Lakeview Merchants is giving away free tickets to the Art Institute of Chicago for St. Patrick's Day. 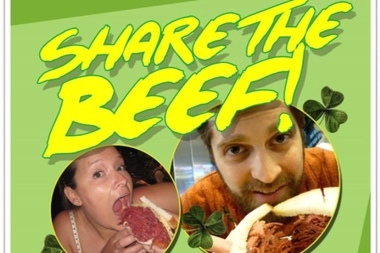 LAKEVIEW — Before devouring your St. Patrick's Day corned beef sandwich, take a selfie first. It could get you free admission to the Art Institute of Chicago. Central Lakeview Merchants is celebrating St. Patrick's Day with a special offer for March. Those who post selfies of themselves eating the sandwiches (which may or may not be actually, in fact, Irish) and tag Central Lakeview Merchants on Facebook or Twitter will receive a free admission ticket to the museum. The promotion comes at the perfect time, as the Art Institute's new exhibit, "Ireland: Crossroads of Art and Design," opens Tuesday. "We had obviously a lot of members that will be serving corned beef, and we thought with St. Patrick's Day coming up, we tried to figure out a way we could pair all those businesses together," said Jeff Briggs, who handles business relations for Central Lakeview Merchants. Frasca's Pizzeria and Wine Bar will bring back its Guinness Pizza on St. Patrick's Day. Q-BBQ is bringing back its smoked corned beef sandwich through the end of March. The Q-version of the classic St. Patty's dish has a hickory smoked flavor and comes with homemade sweet cabbage and horseradish. Check it out at the Lakeview Q-BBQ, 714 W. Diversey Parkway. Frasca's Pizzeria & Wine Bar will have its special Guinness pizza for one day only — St. Patrick's Day. 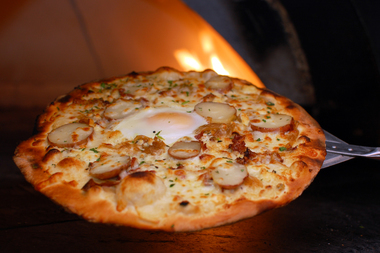 The pizza features a Guinness stout thin crust, béchamel sauce, roasted onions, fingerling potatoes, bacon and a sunny-side up egg. Kids eat free 4:30 to 6 p.m. at Frasca's Pizzeria, 3358 N. Paulina St.
Crosby's Kitchen will have traditional corned beef and cabbage special ($15) and shepherd's pie ($12) on Saturday and Sunday. Kids eat free 4:30 to 6 p.m. Crosby's Kitchen, 3455 N. Southport Ave., will also feature a weekend brunch with Irish classics like house-made corned beef hash and Irish coffee. Real Kitchen continues to serve Trout Almondine ($12.50) through Sunday as one of its six ready-to-go entrees that can be picked up at the restaurant or delivered. From Saturday through Tuesday, a corned beef and cabbage dinner ($11) will also be available. Side dishes include roasted garlic mashed potatoes ($2.75) and ginger carrots with peanuts and cilantro ($3.50). Real Kitchen has locations in Lakeview, 3301 N. Sheffield Ave., and Ravenswood, 1433 W. Montrose Ave.
Newport Bar & Grill will offer drink specials ($4 green beer, $5 Jameson shots and $5 Guinness drafts) along with $5 corned beef sandwiches on Saturday in honor of the Chicago St. Patrick's Day parade. The festivities continue Sunday with $2.50 domestic bottles, $4 green beer and $5 Jameson shots, along with $6 Irish coffees during brunch. For St. Patrick's Day itself, the bar will offer $3 Fireball shots, $8 pitchers of Budweiser and Bud Light and $6 wraps and fries. Newport Bar & Grill is in the Southport Corridor, 1344 W. Newport Ave.
Affinity Salon & Spa will host an open house from 5 to 8 p.m. Saturday at 3021 N. Broadway St. Wine and appetizers will be served, while guests can celebrate St. Patrick's Day with green nail polish and eyelashes. There will also be prizes, including 5 to 30 percent off services at Affinity Salon & Spa.